With the new year officially in full swing, there is no better time to shop for a fabulous new wardrobe. Whether you’re looking for jeans, comfy pullover sweaters, a new leggings collection or just ready to revamp your style, now is a great time to take action! Thanks to Macy’s, we can scoop up a variety of garments while staying on budget! The Macy’s One-Day Sale is officially on and we can’t wait to satisfy our fix! We live for a sweet deal and once we spied a 25 to 70 percent off markdown on clearance items, we couldn’t help but swoon— and that’s not all! There is also a great activewear deal at 30 to 40 percent off currently happening. Now we can shop our favorite essentials and head to the gym in style. If that’s not enough, we can also score free shipping when we spend $25 and more through Jan. 5. Ready to shop? Check out all of our favorites we’re adding to our closets! When it comes to finding the perfect bra, an unlined bralette is always a smart choice and can always be counted on for comfort. So naturally, once we spotted the Calvin Klein Body Unlined Bralette, we immediately were smitten. Made with soft cotton and styled with a low-cut silhouette, this bra can easily be worn every day with our ensembles. Complete with adjustable, convertible straps and an elastic band, this undergarment will become our go-to pick in no time. Best of all? This design is a Kardashian favorite, so we know this style lives up to the hype! Sizes extra small to large are currently available. See It: Grab the Calvin Klein Body Unlined Bralette at Macy’s for 40 percent off the original price of $32, now $19 while it’s still in stock. Not quite feeling it? Check out other bralette styles at the Macy’s One-Day Sale today! A comfy jacket is an absolute must-have for the chilly weather season! While finding a layer that’s stylish and cozy can be quite the challenge, we’ve met our match with the Marc New York Paige Bouclé Coat! Designed with a wool blend fabric, we can rely on this chic number to tackle the chilly temps. There is a two-button front closure and a notched collar that exudes classic sophistication. The welt pockets in the front will help keep our hands warm and house our small valuables seamlessly. Available in a wide variety of hues including earthy tones and pretty neutrals, there is a color to suit every fashionista’s needs. Sizes 2 to 10 are currently available. See It: Grab the Marc New York Paige Bouclé Coat at Macy’s for 41 percent off the original price of $275, now $160 while it’s still in stock. Not quite your style? 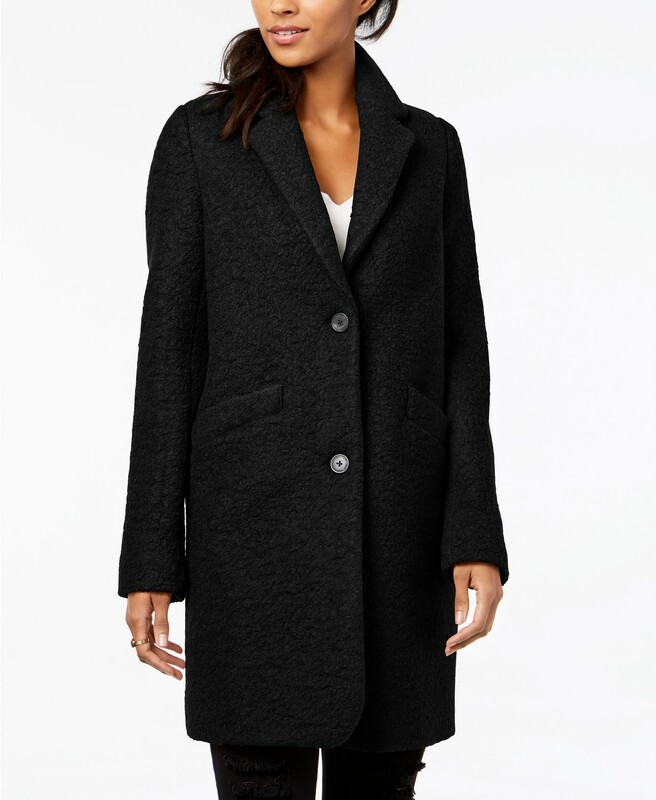 Check out other coat styles at the Macy’s One-Day Sale today! If you ask Us, every fashionista should have a stylish boot in their closet. A winter essential, the INC International Concepts I.N.C. 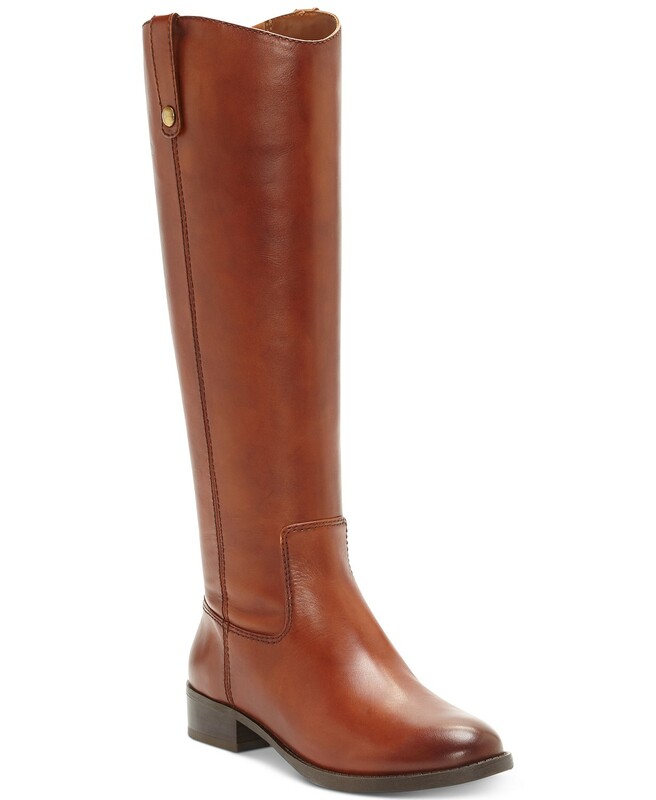 Fawne Riding Boots will keep our feet warm in style. With a heel coming in at just over an inch, these boots will provide comfy wear all day long. Styled with a studded pull-tab and rich leather, these boots have a zip closure by the inner ankle for easy wear. These boots are available in multiple hues ranging from pretty browns to a muted navy shade and sizes 5 to 9.5 are currently available. See It: Grab the INC International Concepts I.N.C. Fawne Riding Boots at Macy’s for 50 percent off the original price of $180, now $90 while it’s still in stock. Not quite feeling it? Check out other riding boot styles at the Macy’s One-Day Sale today! There is no denying that leggings are the ultimate essential! A trendy style that can easily pull virtually any look together, we simply can never have enough. So, it was only right that we added the DKNY Sport High-Rise Logo Workout Leggings to our collection. Sporty and every bit as comfy as we could imagine, this black garment will get plenty of wear with our wardrobe. Featuring a high-rise cut to complement our figure and an amazing amount of stretch for easy wear, these bottoms are a true standout. There is also a sleek logo print at the lower leg for a stylish touch. See It: Grab the DKNY Sport High-Rise Logo Workout Leggings at Macy’s for 30 percent off the original price of $49, now $34 while it’s still in stock. Not quite your style? Check out other leggings options at the Macy’s One-Day Sale today! For days when we’re running errands, we need an accessory that provides hands-free convenience. While there are many purses to choose from, we just can’t stop fawning over the DKNY Saffiano Leather Bryant Flap Cross-Body. Pretty and polished, this leather purse will always keep Us ahead of the style game. Featuring a compact silhouette, we can store plenty of our essentials without the heavy feel. There is also an exterior and interior slip pocket for extra space. Complete with an adjustable cross-body strap and shiny gold-tone hardware, this handbag will pair perfectly with any outfit. Available in multiple hues including pastel shades, neutrals and vibrant colors, the possibilities are truly endless for a fashionable look. See It: Grab the DKNY Saffiano Leather Bryant Flap Cross-Body at Macy’s for 45 percent off the original price of $148, now $80 while it’s still in stock. Not really feeling it? Check out other cross-body styles at the Macy’s One-Day Sale today!